Simply a Better Window & Door Header! The EH Lite offers many of the same benefits of the ExpressHeader at a reduced price point. Contractors will appreciate the ease of installation at the job site, and homeowners will enjoy the increased energy efficiency that equals a cost savings in their annual heating and cooling costs. Coated with LVL sealer and bonded with exterior structural adhesive. Value engineered for commercial jobs. Custom depths available (call for details). One piece express installation, no assembly needed. Right size every time. Header is always straight, no cupping or twisting. Less call back for drywall problems. Download the EHLite Flyer (PDF) for more detailed information, including Roof & Floor Load Tables, and Installation Details. 3-1/2″ EH Lite insulated header pictured above. 5-1/2″ EH Lite insulated header pictured above. One-piece express insulation allows for faster construction. Available in lengths up to 16′, cutting is easy and effortless. Two different nailing patterns makes nailing a breeze. Coated for construction site weather protection. Panelizers and Production Builders around the United States are realizing the benefits of the EH Lite. Since it’s a one-piece install, the days of building window and door headers are over! 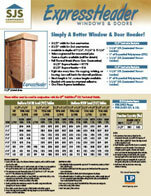 Insulate and reduce energy costs for your customer. Insulation value of R8.4 on the 3-1/2″ and R17 on the 5-1/2″ helps achieve new energy codes. With no cupping, twisting, or bowing, there are less drywall problems. The EH Lite can be installed with the LVL side facing in or out. A 2-x must be nailed to the top to control rotation and a proper bearing installed at each end. 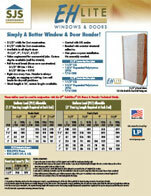 Download the EH Lite Flyer for additional installation details. ***Example of improper installation! *** When dropping header down from top plate a 2-x must be installed on top of header in which to nail studs. Proper bearing must be installed at each end.